Down by three with 21 seconds remaining, Desert Hills head coach Ron Denos called timeout to set up a play. 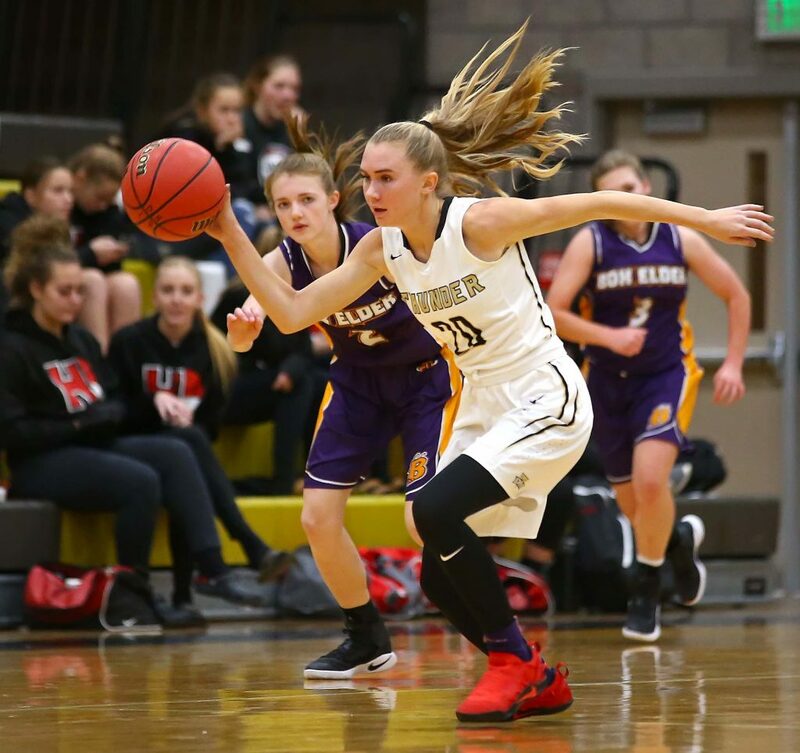 After inbounding the ball to the left side of the arc, the Desert Hills wing players were covered and passed the ball around till it got to the hands of post player Kami Bliss. 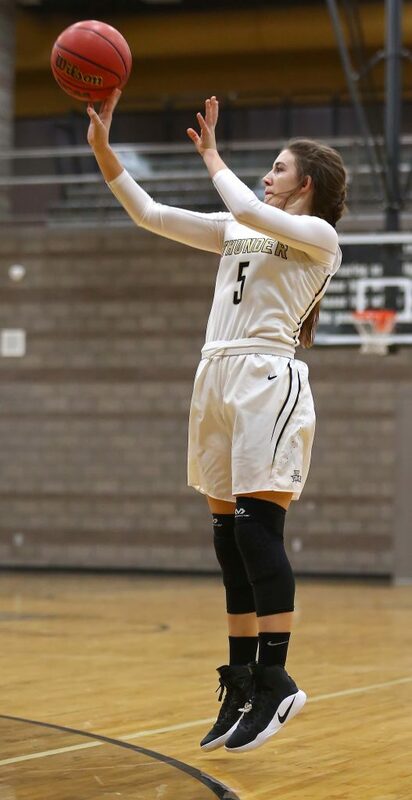 She looked to the right as if she were going to continue the passing, then lined up the shot from 20 feet out and hit nothing but net. The shot sent the game into overtime, but the Lady Bees hit some key free throws down the stretch. After a free throw gave Box Elder a two-point lead with 10 seconds remaining in overtime, the second free throw rolled out. The rebound eventually wound up in Jess Mathis’ hands. She drove down the court and got a shot off from the 3-point line on the right side that came up just short. The Thunder would control the game for most of regulation. 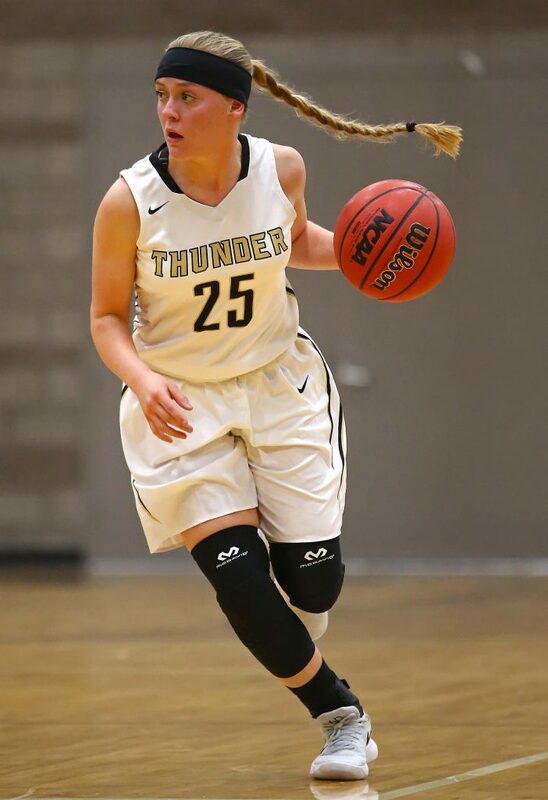 The inside play of Thunder posts Bliss and Kelly Nance was instrumental to Desert Hills offensively as they combined for 23 points. 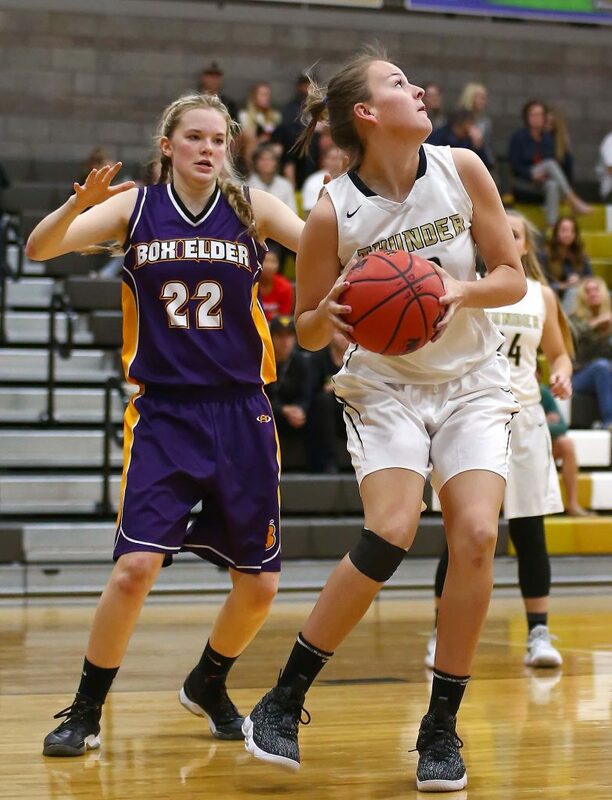 Rachel Myers played great defense on Box Elder’s Emily Isaacson. Isaacson still scored 20 points, but after two initial 3-pointers, most of her other baskets came on put backs and out-of-bounds plays. 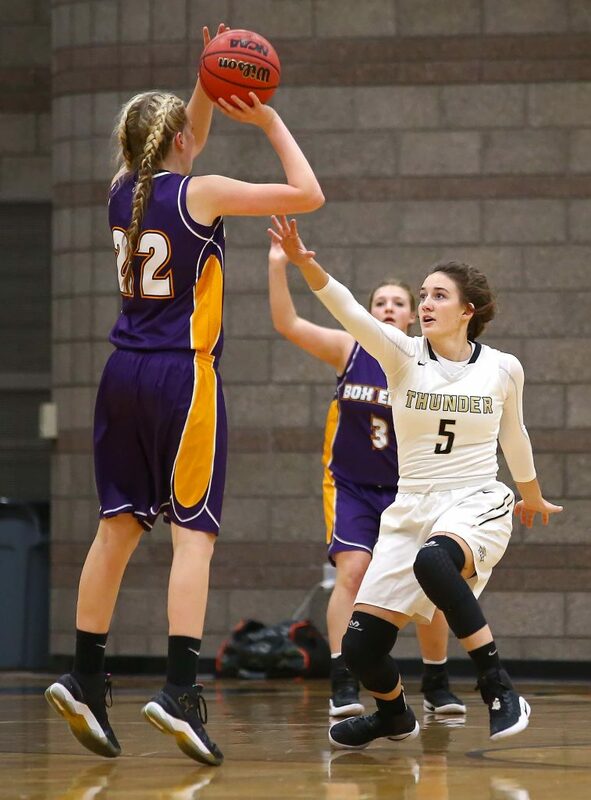 She and Morgan Reeder combined for 37 of Box Elder’s 52 points. Bliss led the Thunder with 15. Myers and Katelyn Philips scored nine apiece. Nance poured in eight. The Lady Thunder fall to 0-1. 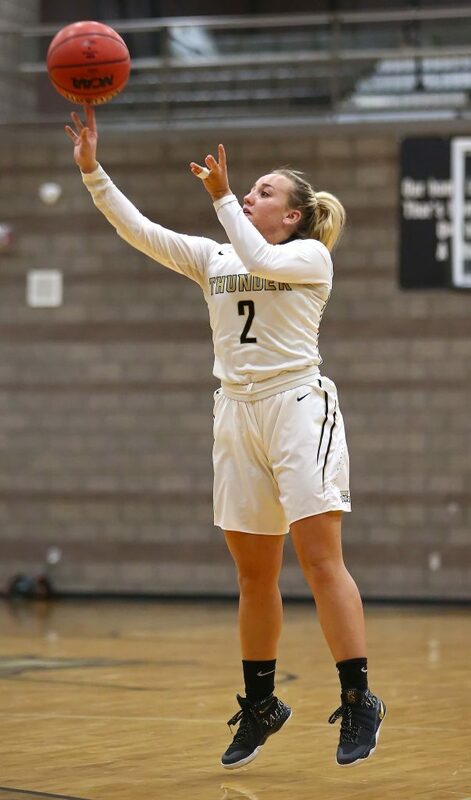 Desert Hills will play Logan Friday night at home at 8:30 p.m.
Tylei Jensen had a 3-pointer and a three-point play in the first quarter when she paced the Lady Warriors with 10 points to open up a 16-11 lead after the first quarter. Snow Canyon would incrementally add to its lead with each stanza, eventually stretching it to double-digits. 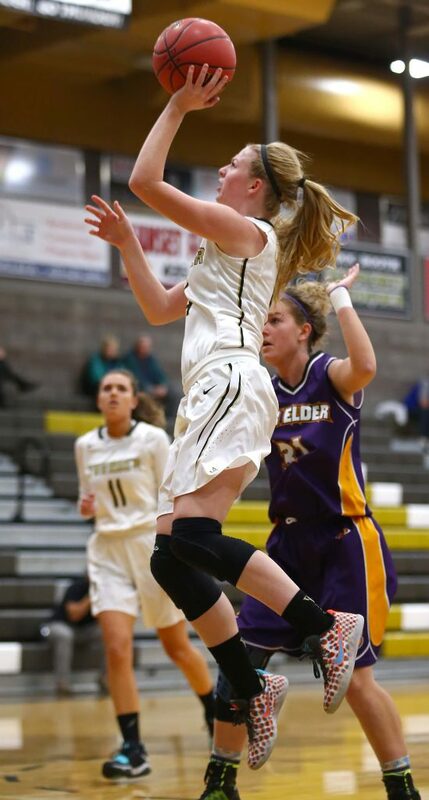 Individually, Jensen led the team with 16 points, six assists and two steals. Olivia Harris joined her in double figures with 10. Hallie Remund and Mel Kata scored nine and eight, respectively. 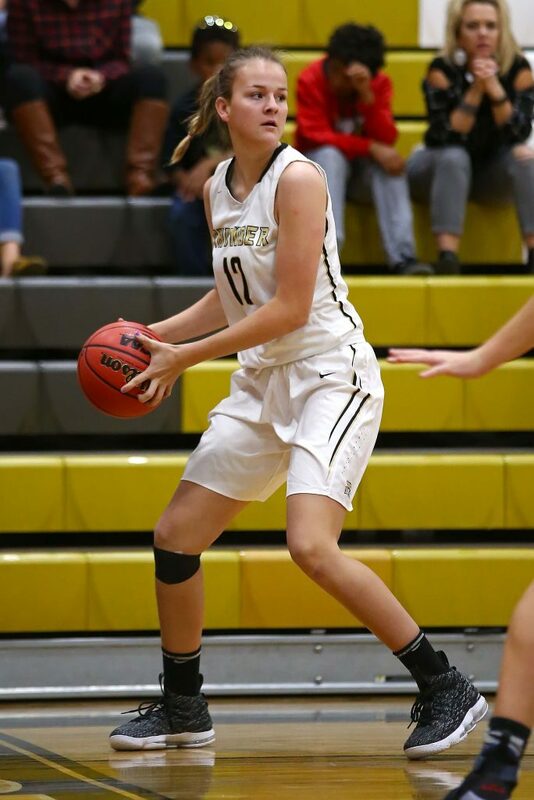 Kata also led the team with nine rebounds. Snow Canyon evens its record to 1-1. The Warriors will play Salem Hills Friday at 7 p.m. The game will be played at Desert Hills High School. The Tigers took a 19-12 lead at the half, but were not able to hang on in the second half. Logan had the lead late on two free throws with six seconds remaining. The Lady Tigers had a chance to tie the game. 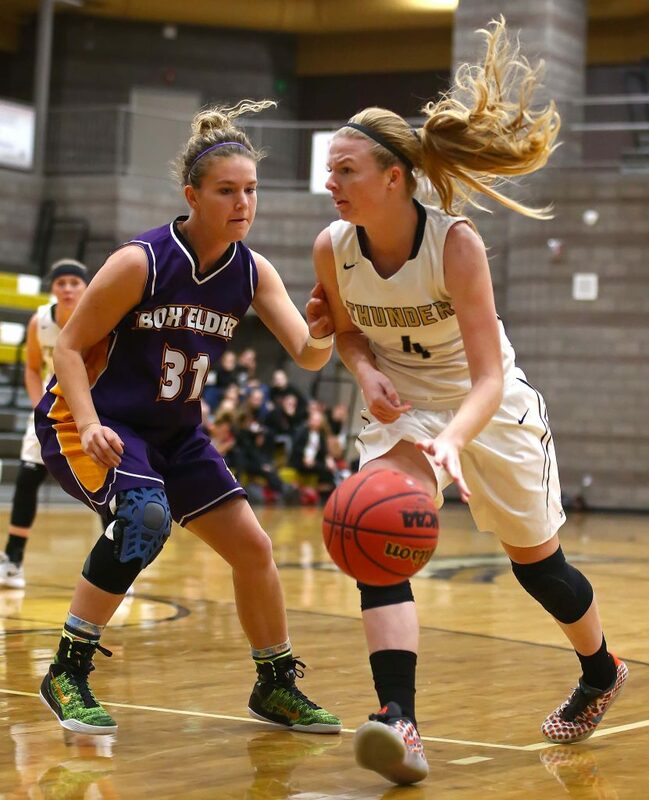 Point guard Kylee Stevens drove the length of the court and drew three defenders. 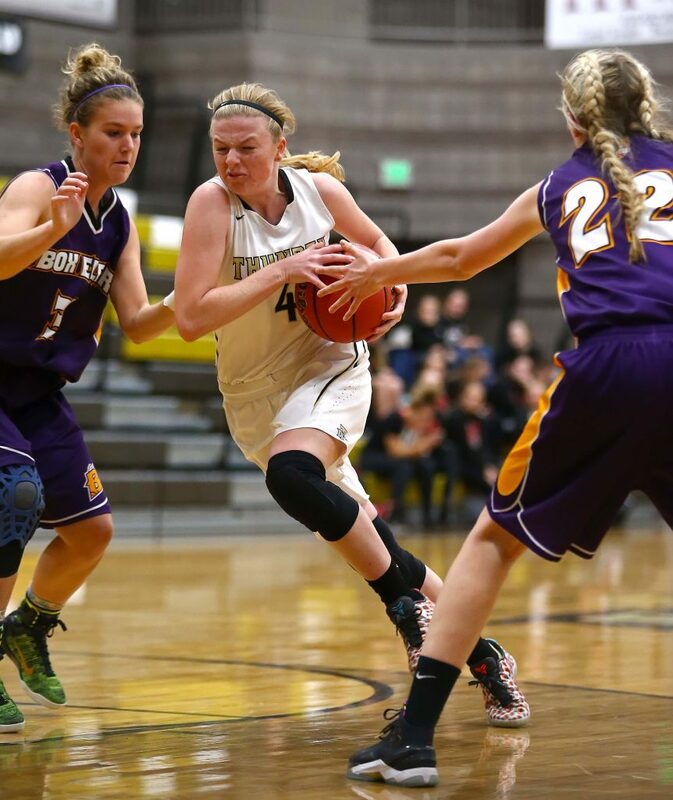 She kicked the ball to Halli Gubler on the baseline, but the last second shot came up short. Hurricane shot 41 percent from the floor. 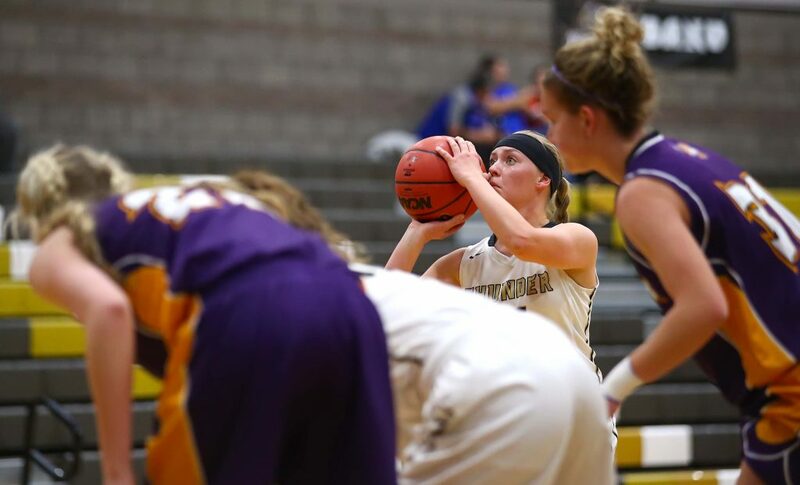 Individually, Madi Hirschi led the Tigers with 12 points, hitting four of her six 3-pointers. Hailey Homer scored nine. Jayden Langford and Stevens had seven apiece. Kelbie Dayley led the team with five rebounds. Langford and Hirschi each had three assists. Stevens and Langford led the team with three steals apiece. The Tigers fall to 0-1. They will continue play Friday against Juan Diego. 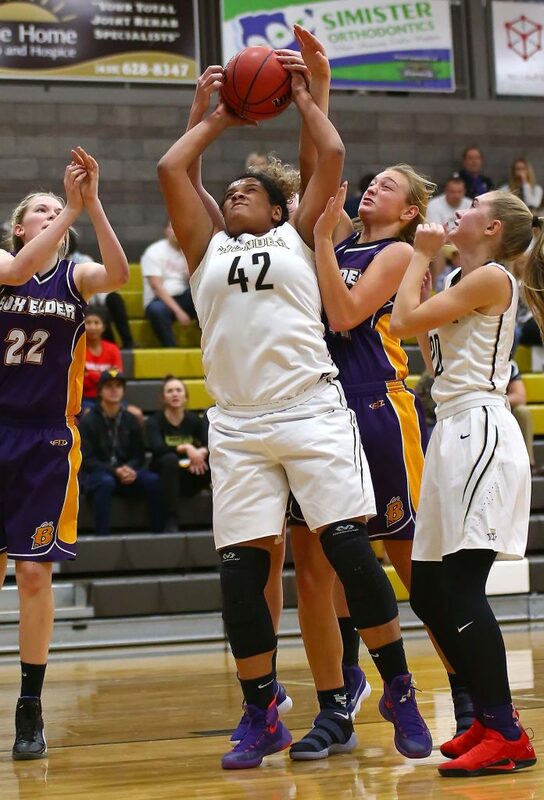 Game time is 5:30 p.m. at Desert Hills High School. The Lady Reds hosted a very good Beaver squad. At halftime, Cedar was looking at a 20-16 deficit. Coming out of the second half, the Lady Reds went on a 22-4 run to take control of the game. Beaver had only two field goals in the second half. In fact, the visitors scored 23 of their 38 points at the line. Japrix Weaver led the team with 13 points. Davis scored 12. Brooke Shoop and Bailee Fielding scored six and five, respectively. Davis, Fielding and Dream Weaver each had five rebounds. Dream Weaver also had two assists and two steals. Cedar improves to 1-1. The Lady Reds will play again on Dec. 5, when they travel to Springville. In the early season, Region 9 teams have a total of six losses. Three of those have come at the hands of the Lady Wolves. Enterprise’s defense stifled the Lady Falcons, limiting them to just 10 points in the first half. The Falcons trailed by eight, 18-10. Canyon View stayed with Enterprise in the third quarter, but still faced a 29-21 deficit going into the final quarter. In the fourth, the Falcons could not gain ground, however. Individually for the Falcons, the offensive production was balanced as Addison Newman, Brielle Fullmer, Cristal Elias and Natallie Garrett all scored five points each. Enterprise was led by Jessica Holt with 10 points. Kaytlyn Miller and Ronnie Robinson each had eight points. Canyon View falls to 1-1. The Lady Falcons will host Beaver on Dec. 5.